The Tobago Tourism Agency (TTA) reported last week that it's experienced a 90 per cent increase in international arrivals since Sunwing Airlines out of Toronto began weekly flights to the island. Sunwing began flights from Pearson International Airport in December last year and has flown into ANR Robinson Airport ten times since then, with a flight capacity of 189 passengers per week. Much of that capacity seems to have been handsomely filled, with 1,399 passengers coming to Tobago at an average flight capacity of 74 per cent. Tobago has enjoyed a 94 percent stay over ratio with these flights and 522 of the visitors stayed at tourism accommodations. There has been no explanation of whether the unaccounted stays of other visitors represent a strong diaspora element in these visits or a rise in the use of private households using the AirBNB model. Understanding that distribution will be critical to understanding and managing this windfall of visitors. Trinidad is reporting high occupancy for Carnival, but an annual overall decline in visitors is shaking the confidence of smaller operators in the industry. Saturated occupancy has long been a hallmark of the Trinidad tourism experience during the festival. The country does not have enough room stock to meet demand during Carnival and is overstocked for the remainder of the year, which has seen a drop in annual occupancy from 60.1 per cent to 58.9 per cent. Smaller hotels and guesthouses have dropped more steeply to between 45 and 35 per cent annually. There has been an annual decline in visitor arrivals from a 2015 peak of 417,314 to the 2018 tally of 356,044. In Tobago, occupancy for hotels was even lower in 2018 at 30 per cent, while guesthouses registered an appalling 23 per cent. A surge in guest arrivals via cruise ships is likely to plummet because, as Chris James, president of the Tobago Hotel and Tourism Association explained, Tobago benefited in 2018 from damage to other islands in the Caribbean during the hurricane season. James is also concerned about issues of representation because it has no formal voice on the board of the TTA and laments shaky collaborations with national tourism development agencies. The Sunwing factor is critical to Tobago’s tourism sector. The island’s tourism industry needs to be bolstered by a rise in occupancy, which will come from visitor arrivals by air, not by floating hotel. 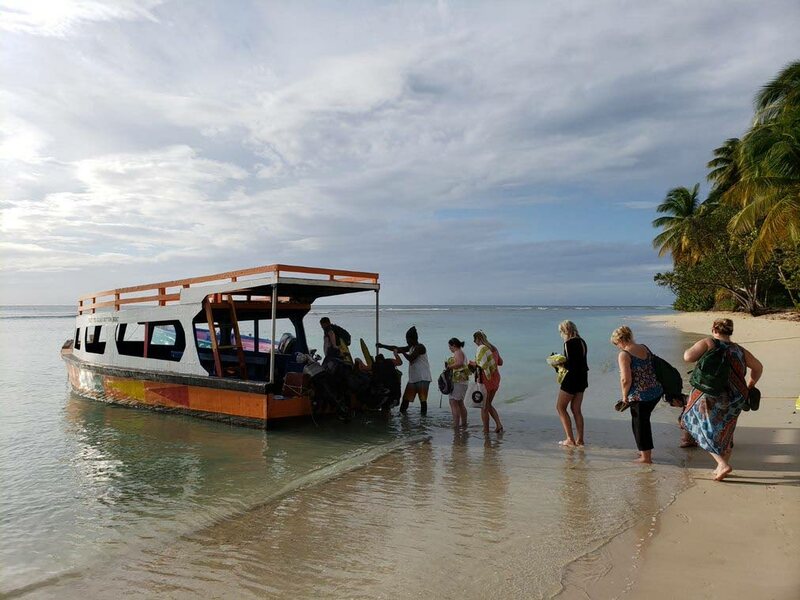 Confidence in the seabridge connection between Tobago and Trinidad will also boost staycation visitors, good candidates for increasing the off-season occupancy rate, particularly at smaller establishments which are flatlining. Sunwing isn’t responsible for giving people a reason to fly into Tobago, so stakeholders must develop a marketable and competitive profile for the island as a regional destination, something that remains a fragile proposition. Reply to "Sunwing shines Tobago tourism"